Spice Box Designs: 7000 Bracelets of Hope Blog Hop. 7000 Bracelets of Hope Blog Hop. 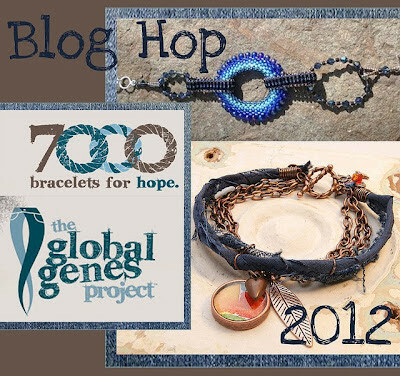 7000 Bracelets of Hope is run through the Global Genes Project, a rare disease group for children. The bracelets are donated to the mothers and caretakers of these children, as a way to give them a little support and lift their spirits. The Blog Hop sign ups are today through February 11th. The Hop itself is February 25th. 1. Leave a comment here with your blog address and e-mail address. 2. Grab the button for the Hop on the Top Left of my page and put it on your blog. 4. Post a picture of your Bracelet on February 25th along with the link of participants Erin and I will send you. Marla, This is a great thing we are involved in and I for one am very touched to be involved. I'm sorry to hear that you have lost a child I can not even begin to imagine how that feels. I agree Therese! I am very excited about this. Thank you for your kind words. I lost my youngest daughter July 23, 2006. Marla, Thank you so very much for this post and for spreading the word. I am so sorry for your loss. I have 2 children and cannot imagine that pain. You have a big heart and big reasons for helping out. We really appreciate it! Thanks Christine! I am very excited to be included in such a great cause. Let me know if there is anything else I can do to help!